Crazy and Fun Time at Fuerza Bruta (Look Up)!!! Fuerza Bruta! Fuerza Bruta! Fuerza Bruta! What a crazy night of dancing, shouting, clapping, and wow-ing, filled with many surprises! I didn't have a Valentines date like most of the people were longing for, but I had an awesome time watching the premiere of Fuerza Bruta (Look Up) at the Manila Hotel Tent City. This has got to be the most unique show I've EVER watched in my entire life! Glad I gained a new friend, Valorie who happens to be a blogger and a jewelry maker too. Later on, I saw Vince and Hannah, as well as Patty with her fiance Patrick. Translated into English, it means "Brute Force." It's basically an interactive theatrical experience originally from Buenos Aires, Argentina. I say it's unique and one-of-a-kind, because the show features a non-stop collision of dynamic music, visceral emotion, and kinetic aerial imagery. I actually didn't know what to expect before going to the show, so perhaps that made the watching even more fun! We were all standing in a huge, dark hall for about 60-minutes, watching a completely non-verbal performance while looking up. Fuerza Bruta used dance, acrobatics, visual displays, and pumping beats. I actually didn't feel the long standing, because we were moving around as the show went on. It's also not the typical sit-down, three-hour musical play where actors would tell a story. 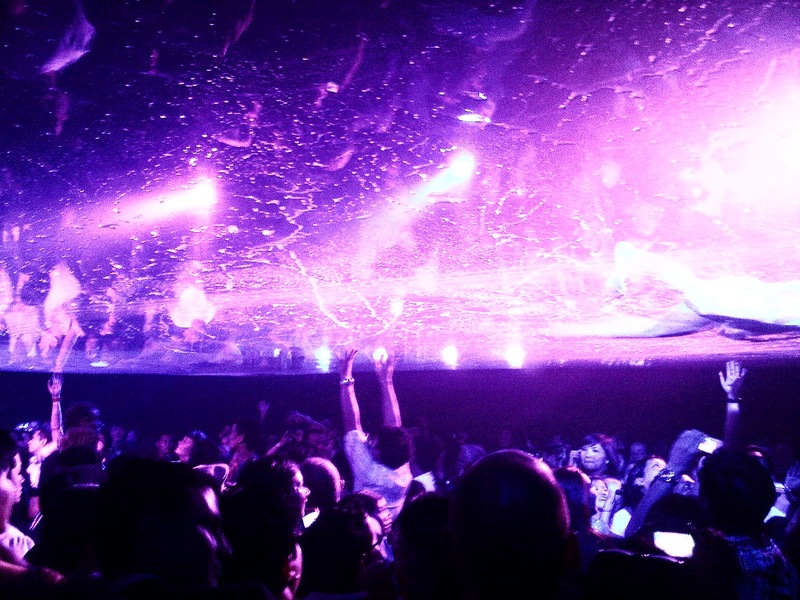 Fuerza Bruta forced our minds to create our own story out of the visual spectacle we were seeing right at that moment. Thinking aside, all I did was to just enjoy the show and have fun as the actors move around the hall. Fuerza Bruta was like a surprise show that doubles as a dancing party. This heart-pounding celebration featured about nine performers running and tumbling across a vertical wall of Technicolor cloth. As well, there were flying dancers, a man bursting through moving walls, and dancers wading on a small puddle of water on a hanging pool, going very near our heads. The show ended with a techno dance party, with some of the audience getting wet as they danced to the music mixes of the DJ. After the dancing was over inside the hall, most of the guests stayed for the After Party at the Fuerza Bruta Lounge to get some cockatils and drinks. What do you think will the characters (pictured above) do? 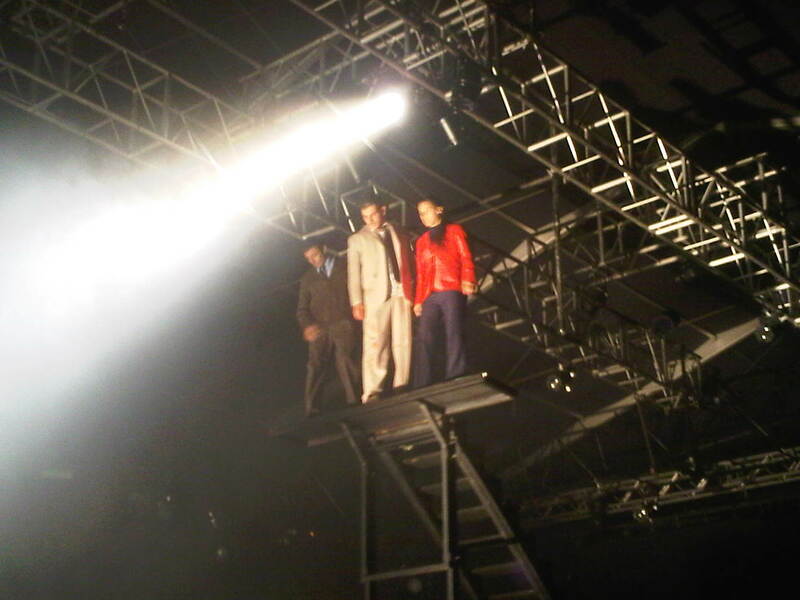 I tell you -- you've gotta watch Fuertza Bruta (Look Up)! 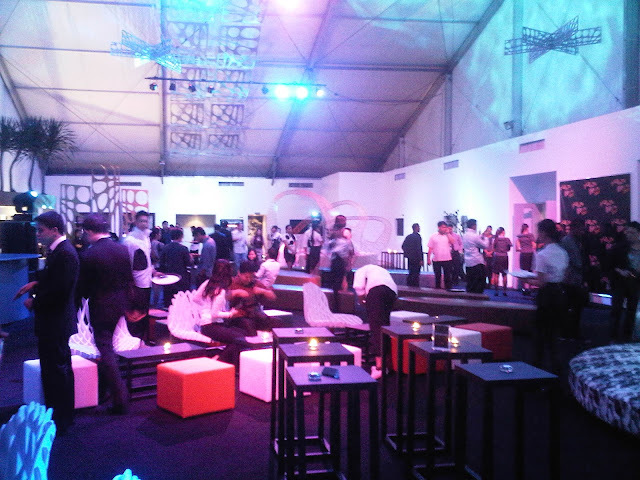 It will run everyday from February 14 to March 26, 2012 at the Manila Hotel Tent City. You can get more information and purchase tickets from Hoopla's website. Tickets range from Php2,000 to Php3,000. Enjoy as much as I did! This looks like a really nice and fun event! :D I hope I get to experience Fuerza Bruta some time soon.